Taking your kids out in the woods to camp is indeed, a great experience for them. This is because it allows them to be more in-touch with mother nature, and is a great way to bond with one another. There’s always something about new environments and nature that we adults love, and as parents, this is one of the things we’d like our kids to appreciate as well. Unlike us grownups, however, kids have special needs to be attended to. And we always have to keep an eye on them because of as beautiful as the woods are, it has quite a lot of hazards we have to look out for. 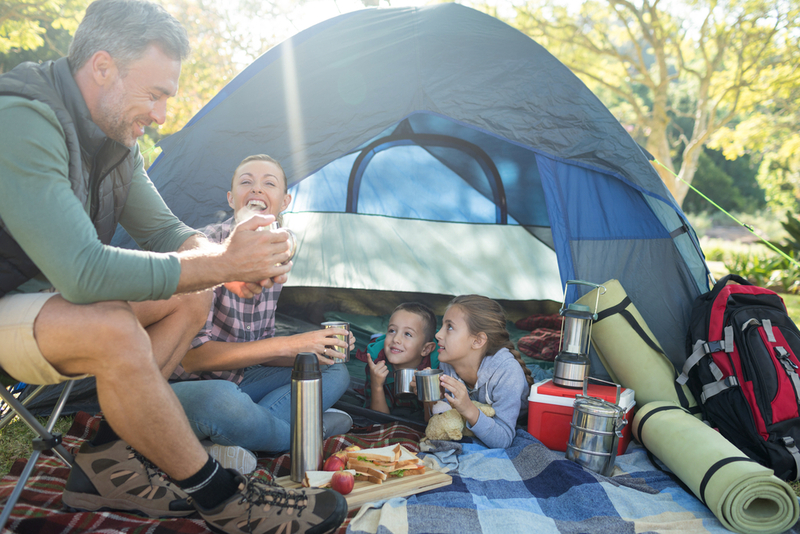 If you want to take your kids out for camping, here are some tips that may come in handy to make the most out of the experience. As a parent, this also allows you to prepare yourself and have an idea on the things you have to pack up during the actual camping day, in what outdoor conditions is your kid most comfortable, or whether or not they are ready for a true camping experience. Usual things you have to be mindful of during your trial camp would be how to put up your tent, the number of beddings to bring, as well as food and other things to keep your kid as comfortable as possible. As mentioned previously, too many new things could end up overwhelming your young ones. If you’re going to spend more than just one night at the campsite, make it a point to keep all schedules for basic daily activities as similar as possible. This includes the time of the day you wake them up, the time you read their bed-time stories or do other night-time rituals, as well as the times of the day that you eat. For the rest of the times, however, make sure that they are as exposed to the outdoors as possible. Allow them to have fun and be more connected with nature. Don’t allow your kid to bring with them their tablets and portable gaming consoles, as this is supposed to be a time for them to keep in touch and appreciate nature, and bringing all their electronic entertainment robs them of this opportunity. In other words, having your kids bring their gaming consoles and electronic entertainment defeats the whole purpose of the trip. Bring your phones with you though, but keep them in the car for use only for emergency or work reasons, nothing more, nothing less. Another nice thing to do is to use “dumb phones” which do not have all the electronic games kids would usually love to play. While a lot of kids can be kept occupied with leaves, stones, sticks, and the like, chances are, they’d get bored of all this fast. To keep them entertained, bring with you some small, travel-sized board games, a few toys, and playing cards. Not too much though, but make it a point to bring games that do not need gadgets of some sort. Other games you could bring along with you include ropes, bubbles, sand toys, as well as kid books that are camp-themed. If your kid is still potty training, don’t forget to bring their potty trainers. It would be difficult for kids who have not yet moved on from this phase to move their bowels over an open pit, and it would be too difficult for more than one person to be inside a portalet. To make each potty session more convenient, bring along a small camping toilet inside the tent, which is much more convenient to use than a Porta-San outside of the tent. Regardless of whether you are camping with your kids or not, it always pays to travel lightly. Furthermore, it leaves you with a lot fewer things to worry about. Even if you aren’t able to bring much, still don’t forget your kid’s essentials, and regarding clothing, teach them that certain apparel could always be re-worn, as much of the bulk comes in packing comes from clothes. Check out the camping checklist here. Bring travel packs for soaps and shampoos, instead of the large bottles that you would use at home. For kitchen utensils and cookware, you can improvise with lots and lots of aluminum foil instead. Some camping sites are so popular that they get too cramped during peak seasons like the summer. Other sites, on the other hand, would require a tedious set of requirements. With that said, always visit the venue first and ask the right people on the things you have to take care of, such as advanced bookings, reservations, and volume of people on the day you wish to go out. Make sure to follow instructions, and don’t even think about budging the event. While camping can be a bonding activity for the family, it can also be a good way to bond with friends as well. A friend or two would help to keep the kids entertained much longer than any other gaming tools and toys that you would be bringing along. For grown-up kids, this would allow for more fun and dynamic conversations with each other. If you plan to do this, you can ask for the parent’s permission. If your kid’s friend’s parents are campers as well, then all the better! The outdoors, as beautiful and serene as they can be, is still a place where several injuries could happen, from small, shattered pieces of glass that previous campers may have left, too small but tough chips of wood and stone that could be easily stepped on, there are a lot of hazards out in the woods that you have to be extra careful of. As careful as we are though, kids love to move a lot and are, therefore, at constant risk of being injured, with splinters being the most common injury. Should the unthinkable happen, always have a well-stocked first-aid kit ready for use. There are a lot of pre-stocked first-aid kits you can get in the drug stores nowadays, and make sure the essentials, including Band-Aids, Balms, and Ointments for Bug Bites, as well as ibuprofen, is stashed inside. Last but not least, bring some Duct Tape with you! There are just so many uses for it that you might not even realize initially. From mending torn fabrics on the tent to fixing a broken pole to basic and temporary repair for damaged footwear, or simply waterproofing the things that need to be waterproofed, duct tape would always come in handy for you. Never underestimate how useful it can be for you and your kids! Going camping will always be fun and enjoyable especially if you’re with your kids. Not only will these relieve you of the stress and pressures in life, but this will also make you bond even better with your kids. Take our advice with a grain of salt, and you’ll surely see the wonder unfold fast. Paul Watson is a blogger who likes to share information about camping and the outdoors. He expresses his passion for camping and other outdoors no only by embarking on several outdoor adventures but also writing about them. Fascinating facts about Sri Lanka that you don't even guess!